Keep your home or business in Winston-Salem looking great with our patio pressure washing services. 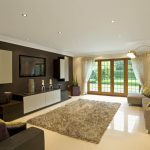 Here at Steam Source, we have the tools and expertise needed to keep your property looking fantastic inside and out. One of our popular services is patio pressure washing. Over time, your patio may start to look dingy, and it can even become a safety hazard if moss or mildew starts to grow on the surface. The good news is that patio pressure washing can quickly and effectively remove not only moss or mildew from the surface of your patio, but it can also remove chemicals, dirt, and any other residue. 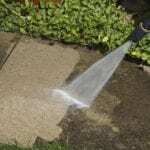 Pressure washing uses a high-pressure spray of water to blast dirt and other materials off the surface of your patio. This method of cleaning is effective for concrete and many other surfaces, including vinyl siding, asphalt, aluminum, and even some wood surfaces. Regularly scheduled patio pressure washing can increase the lifespan of your patio and even add value to your home or business if you are looking to sell in the near future. 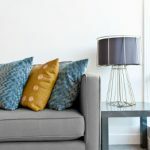 At Steam Source, we provide a variety of cleaning services to customers in the Winston-Salem, North Carolina area, including carpet cleaning, tile and grout cleaning, upholstery cleaning, duct cleaning and window cleaning. We understand that you want to protect the well-being of your family, your employees and your customers, which is why we always use products that are safe for the people who use your building every day. Our main goal is always the satisfaction of you, our customer. We will take the time needed to do the job right the first time, and we offer a free 15-day warranty on all our services. Give us a call today. 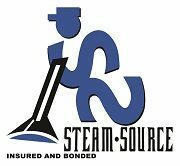 At Steam Source, we offer patio pressure washing services in Winston-Salem, Greensboro, Kernersville, Clemmons, Advance, High Point, Mocksville, Pfafftown, Jamestown, Oak Ridge, Summerfield, Lexington, King, Walkertown, Colfax, Lewisville, Welcome, Bermuda Run, Thomasville, Yadkinville, and Walnut Cove, North Carolina.